University Place hosted its first Community Market in 2011. The market took place on the corner of 48th and Madison on Wednesdays from June through September. The market featured fresh produce from local farmers, arts and crafts, food from local restaurants, and other gourmet food items. There was live entertainment each week from singing to dancing to magic. Lincoln City Libraries, St. Mary’s College, and other organizations handed out information to community members. Members of the University Place Community Organization, students from Nebraska Wesleyan, and other members of the community volunteered their time to make the market a success. The 20th annual University Place Easter Egg Hunt was held April 23, 2011 at UPCO Park. 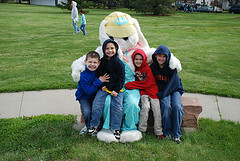 All participants had a picture taken with the Easter bunny and received a bag of candy and a toy. Over 200 children participated.